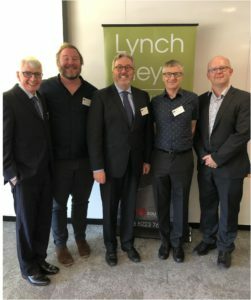 Adelaide Law School’s research unit Regulation of Corporations Insolvency and Tax (ROCIT) held a Bankruptcy Trustees’ Forum on Friday last week. Adelaide law firm, Lynch Meyer was again our partner. The day included outstanding presentations on contemporary issues from AFSA’s Chief Executive, Professor Jason Harris and Assoc Professor David Brown. A particular highlight was the address from Dr John Tribe of the University of Liverpool who was brought out from the UK especially for the event. He addressed the history and role of bankruptcy registrars as well as some commentary on the present UK bankruptcy position in light of Brexit. Professor Symes’ presentation on Compositions will feature at an event later in 2019. This entry was posted in Impact, News and tagged Bankruptcy Trustee's Forum, Insolvency and Taxation (ROCIT), ROCIT. Bookmark the permalink.